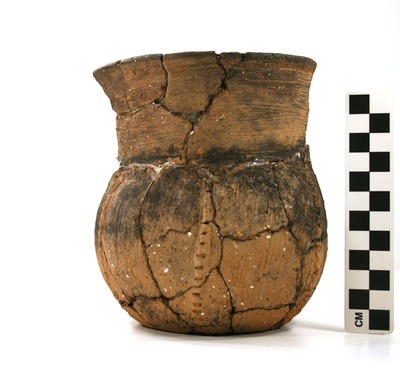 "41UR315, Burial 32, Vessel 178" by Timothy K. Perttula and Robert Z. Selden Jr.
DECORATION (INCLUDING MOTIF AND ELEMENTS WHEN APPARENT): The rim is decorated with horizontal brushing marks. The vessel is divided into six panels by vertical appliqued fillets that extend from the rim-body juncture to the vessel base. Each vessel body panel is filled with vertical brushing marks. Pease Brushed-Incised jar, Vessel 178, Burial 32.